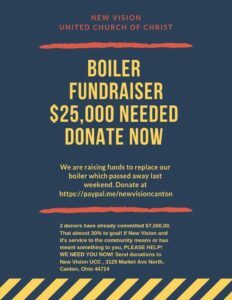 New Vision Friends, as you may know, our boiler died recently and we need to raise $25,000.00 to replace it! 2 amazing donors have already given $7,000.00 toward the goal. That’s almost 30% of the way there! CAN YOU HELP!? No matter whether you attend New Vision weekly or never have been in the building, if New Vision is a special place for you, you can help our mission continue by donating, and any amount helps. Thank you! You can donate in multiple ways. Thank you for your support. Any amount helps! Donation checks can be sent to New Vision UCC, 3129 Market Ave North, Canton, OH 44714. And if you can, please send an email to newvisioncanton @ gmail . com so that we can keep track and be watching for your check. Can’t financially donate but want to help, or want to help in ways beyond donating? Consider sharing the graphic below or the PayPal link on your social media profiles. Thank you! As far as how long we will be worshipping in our space without the boilers, we anticipate at least 2 more weeks. So for the next two weeks, please dress warmly. We’ll update here as more is known!